Cameroon’s Ministry of Agriculture and Rural Development (MINADER) and the World Vegetable Center (WorldVeg) signed a Memorandum of Understanding on 16 August 2018, officially inking a partnership to work together on strengthening vegetable seed systems, mobilizing and training smallholders to produce certified onion seed, and increasing the supply of traditional African vegetables in the country. At the 6th Annual Week of Scientific Research and Innovation in Yaounde, Cameroon in late February, a WorldVeg team had the opportunity to demonstrate their activities to Ministry of Scientific Research and Innovation (MINRESI) Secretary General Rebecca Madeleine Ebelle Etamè, MINRESI’s Minister of Scientific Research and Innovation Dr. Madeleine Tchuinte, and Director General of the Institute of Agricultural Research for Development (IRAD) Dr. Noe Win. The experience of WorldVeg in Cameroon has sparked interest for an initiative to build seed systems in the Central African Republic. Impressed by what he learned from a prior visit with the WorldVeg team, the President of Cameroon asked ten parliamentarians from the north and far north regions of the country to visit WorldVeg activities in Yaoundé on July 7. Onion seed production is a challenging endeavor, but farmers in Cameroon are successfully producing certified seed with the guidance of the World Vegetable Center and PADFA (Projet d'Appui au Developpement Des Filieres Agricoles). 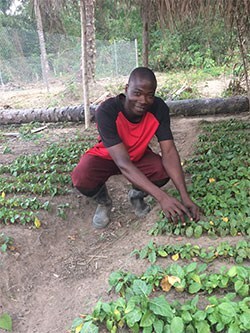 Farmers’ access to quality vegetable seeds is a critical bottleneck in most communities, while enabling government policies to facilitate the establishment of an efficient vegetable seed supply and distribution systems are lacking. Traditional African vegetables were the topic of discussion during "Agriculture: Our Lifewire," a radio program aired on 18 November 2015 in Cameroon. Thousands learn about progress in African agriculture during this lively and informative fair.